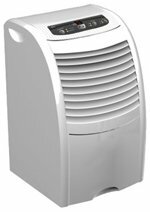 The Haier 65 Pint Dehumidifier (DE65EJ-L) is a high capacity unit intended for use in large areas of the home. It is equipped with an adjustable humidistat, a 24 hour timer and configured for continuous drainage if required. Capable of low temperature operation this unit has easy to use electronic controls and digital display of temperature and relative humidity information. The Haier 65 pint Dehumidifier is capable of low temperature operation due to the provision of an auto-defrost feature. All refrigerant models operate by condensing water vapour from the air on to refrigeration coils which will become covered with ice at normal room temperatures. Auto-defrost counteracts this and enables the appliance to continue operation until a lower temperature is reached. This unit is rated for use down to 41°F and should therefore be able to work effectively in cooler areas of the house. Standard portable models with high water extraction capacity are often used in basements and can be entirely satisfactory. If your basement is finished and part of the living area of the home this unit should do the job perfectly well. If, however, your basement is not typically kept at temperatures in which you would be comfortable, or suffers from seepage of ground water, we would not recommend a portable for this purpose. They are not heavy duty appliances and a purpose designed basement model may be more suitable. All situations vary and it may be a wise precaution to seek professional advice if you are in any doubt. The Haier 65 pint Dehumidifier incorporates an adjustable humidistat with which the level of relative humidity can be controlled. This device works in a similar way to a thermostat and cycles the unit on and off to maintain a pre-set level of humidity. This saves energy and maintains a level of relative humidity constant to within a few percentage points to maintain comfortable conditions for occupants of the home and to protect your property. For a unit of its capacity the DE65EJ-L is relatively compact and light. It is also portable being equipped with caster wheels and carry handles to make movement easier. Although it weighs a little over 43lb it is practical to move the unit from one room to another and with less effort than some other models of similar capacity. The water collection container is relatively large with a 25 pint capacity but will still need regular emptying. The alternative is to take advantage of this unit's capability for continuous drainage. Water can be discharged from the appliance via a plastic hose to any convenient drain. The water is not pumped and drains via a gravity feed and if the nearest outlet is at a higher level a separate condensate pump will be needed to force the water to that level. Typically condensate pumps will be able to raise water between twelve and fifteen feet, sufficient to reach the floor above. Additional features include a washable air filter, two fan speeds, a 24 hour timer, electronic controls and auto-restart to bring the unit back on line after a power outage.